It is the last Saturday in April and therefore the last Saturday of purple scraps. I'm just now home from another Saturday at school with practice AP tests. 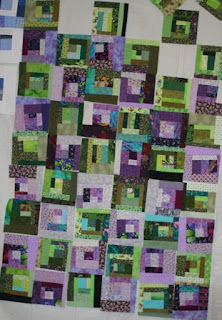 I'm hoping to get the sashing sewn onto the purple and green blocks and perhaps start sewing the blocks together. Post your progress below and start thinking about and end of the month round up coming soon! On Good Friday Kurt thought we should have a family outing. We rented a power boat and puttered around the river for the day. The river is what they call the inter-coastal waterway around here. 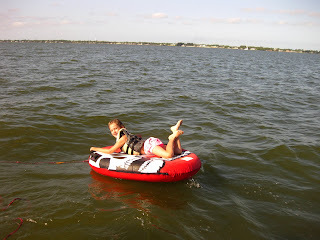 The kids took turns driving and riding along on a tube behind the boat. We saw dolphins and pelicans but no manatees. 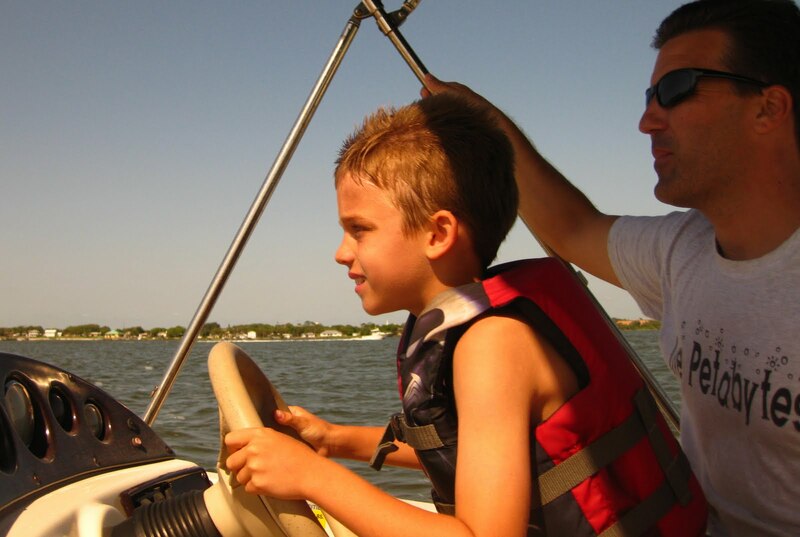 They have already decided that we should rent a boat every year on Good Friday. Today I spent all afternoon and most of the evening grading the free response questions from Thursday and Saturday's practice AP exams. Four questions on each exam for 50 students who have taken a test so far makes 200 essays scored. If I never see and FRQ again it might just be to soon. I've still got one more practice session next Saturday, and after that, I think a multiple choice final will be just fine. 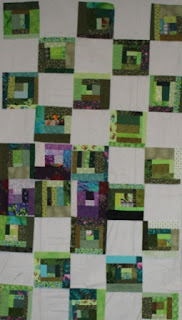 I think the sashing strips give the blocks a little bit of space. I don't have enough of a single green, so I'll have to mix is a bit of the slightly darker green that you see on the outer edge. 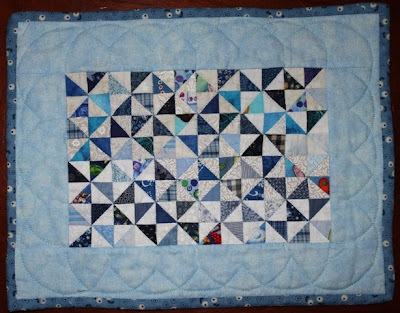 The inner bits are 1.5 inches and the wider outer part is 2 inches, so it isn't much, but I think it makes a big difference in the look of the quilt. Kurt has taken the children off to the Art Festival and I elected to stay home alone. It is the first chance I've had to sit quietly all weekend and I am relishing it. I'm finally starting to see some of the purple mile a minute blocks come out of the assembly line. I've got them up on the design wall to think about for a bit. At first glance there seems to be a lot going on. I wonder if I should group the blocks by color? 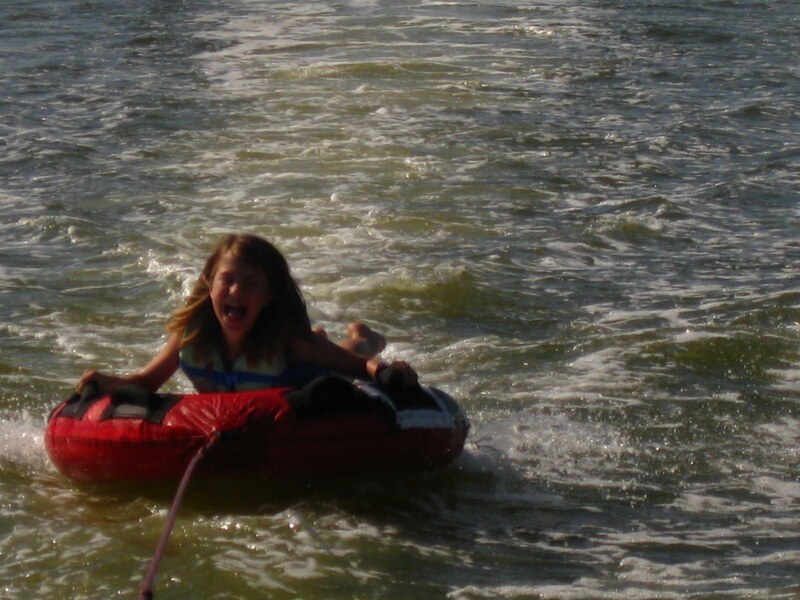 Or maybe do rows? Maybe some dividing stripes will calm it down a bit? For now I think it needs to sit and think a while longer. Mabye soon it will tell me what it wants to do. We are just back from our favorite annual Easter tradition. Each year my good friend Meisje hosts a big party where the main event is an egg hunt for the kids featuring cascarones. I have no idea if I'm spelling it right, but they are confetti filled eggs that get smashed over the heads of innocent bystanders. We always come home with confetti hiding out in all our nooks and crannies. This year we managed to go without a camera, so I'm hoping that somebody will have pity and send me a picture or two. The kids all passed out as soon as we got home and Kurt has run out to get goodies for a morning egg hunt of our own. His family always hid entire baskets instead of eggs when he was a kid and mine did both plastic and dyed eggs, so we always "argue" about what we should do each year. For two years in a row Kurt had the kids convinced that the party was the "real" egg hunt and we skipped the tradition entirely at our house. The kids wised up though and requested that the bunny visit our own house as well. I'm zooming away on my mile a minute blocks. If I were ever home for more than 10 minutes at a time I'm sure they'd be all done in no time at all. I just keep popping them back in for another round until they end up large enough to square up. So far only 3 purples have come out at the end of the assembly line, but there are a bunch that are almost ready to be finished up. 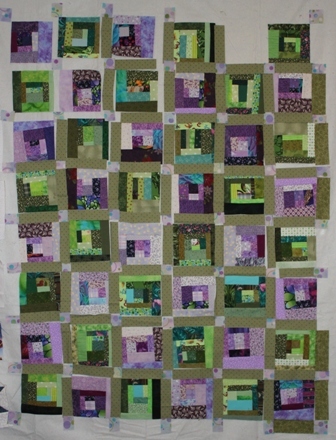 I am thinking of finding a funky purple and green print of some sort to use as sashing between the blocks. Mostly because there are a bunch of seams that would try to fight each other if the blocks go next to each other. The second session of practice AP exams went well this morning. Several of the kids made a point of coming up when it was over and thanking me for coming in on the weekend to help them out. I thought that was very thoughtful of them. When we were all finished up at school I popped into Sears to look at refrigerators again. We've been having trouble finding the style that Kurt wanted (double door fridge on top and freezer drawer on bottom with water and ice in the door) in a color that matched all our other appliances (bisque, also known as beige). They happened to have just the thing I was looking for -- and it was on sale! It should be delivered on Monday between 12:45 and 2:45! I'm sincerely hoping that nothing else breaks in the near future, 'cause I'm all shopped out. Finally home from school. Off to take some photos of my own scraphapiness. The mister linky box will be a bit late today. I came in to school early to give a practice AP test and thought I could get everything fixed up from here. The mister linky site is blocked fromt the school server though, so it will have to wait until I'm home again after lunch. 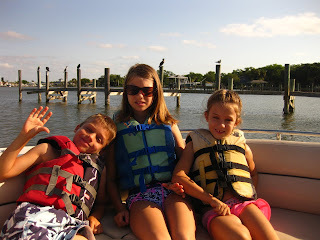 I've got some pretty purple blocks to show and a fun post about our boat trip yesterday as well. Hope you are all stitching away while I'm sitting here on a beautiful sunny Saturday torturing my students with a three hour long exam just for FUN! The Girl Scouts are making rugs out of old t-shirts. They are weaving them on hula hoops using a cute tutorial that the leader found on a Disney Family Fun website. They got started last week, but came home with bags of t-shirts to be cut up for homework. 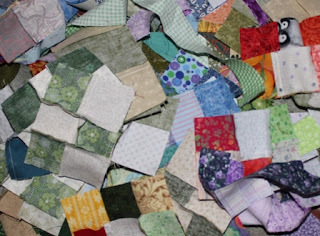 I did Anna's last night and got carried away playing with the scraps. 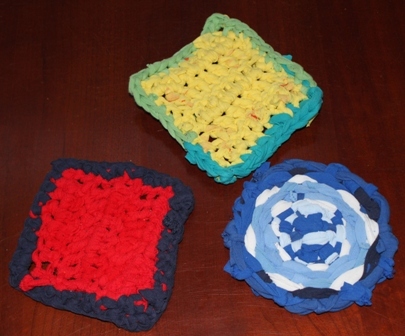 I made two coasters by crocheting the extra bits together and then used an embroidery hoop to weave the sleeves. I thought I was at the end of the extras when our neighbor who is also in the troop came over with her bag of shirts so that we could cut her shirts out together. So I've just finished her homework too, and I'll save the scraps for later. I saw the cutest idea in a blog last week where a lady had opened up envelopes and used them to trace a pattern out of interfaced fused fabric which she put together with cute little buttons and such to make fabric envelopes. 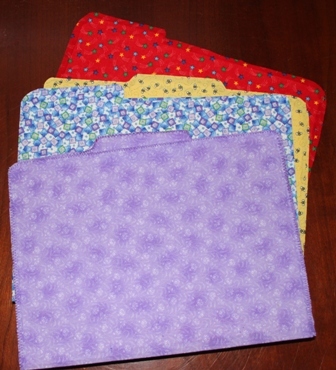 I can't find the link again, but I modified the concept a bit to come up with these fabric covered file folders. Interfacing seemed complicated, so I just took some old folders and used spray adhesive to glue fabric to both sides. Then I trimmed and zigzagged the edges to make color coded folders for school. The edges are sewn together so the papers won't fall out the sides. I did some more work on my green and blue mile a minute blocks, but they aren't done quite yet. The green are getting close, but I'm sorely lacking variety in my purples. I hate to cut up more fabric when the goal is to use up scraps, but maybe I'll search through my stash for small bits and pieces. I guess that is all on the crafty front. Yesterday morning was a Girl Scout garage sale after ice skating. Then this morning I took the kids to see Rio. It was very cute. Kurt came to meet us for lunch after and then we all went shopping. We are in need of a new fridge but can't decide what we want. The rest of our appliances are off white and I guess it isn't very popular anymore, because none of the new styles come that way. We also looked at new couches, and picked one out that we all liked. It is a very soft brown microfiber and comes with a matching love seat and chair. It should be here next weekend. Feeling purple? Please post promptly. It has been a while since I have actually managed to finish anything. 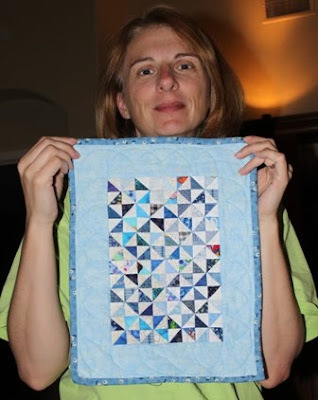 So I went digging through my Rainbow Scraps and pulled out the Blue Pinwheel quilt that I worked on during January. It was finished (even had borders! 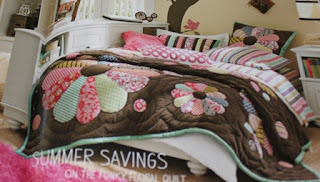 ), but needed to be layered and quilted. I did a simple stitch in the ditch by machine and scallops in the border. 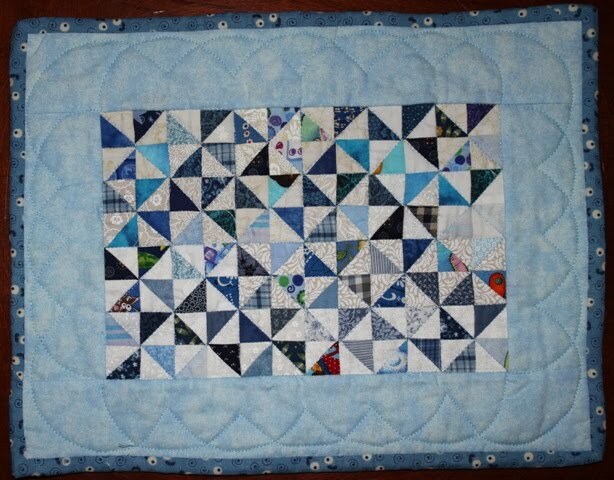 I just finished sewing down the binding, so it is officially done, done. 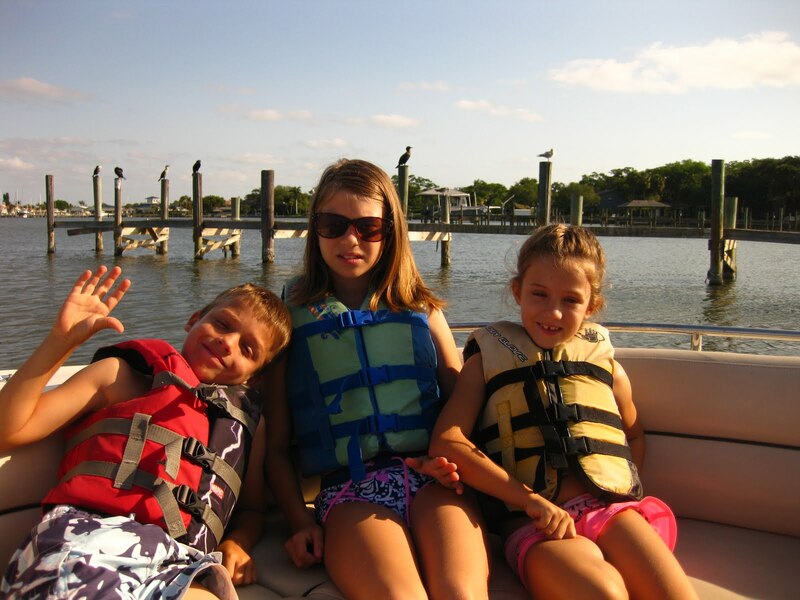 Kurt took the kids to the beach this morning, they came home all sandy and sunburned:). Then I got my hair cut and took Sydney to a birthday party. After that it was a couple of loads of laundry and a bit of puttering around the house. Kurt rented Tron and I snoozed through it. Not a bad Sunday at all. We've got FCAT (Florida Comprehensive Achievement Test) testing this week at school so it will be lots of odd schedules and figuring out where to be. 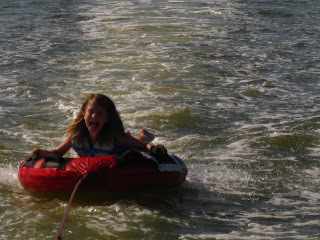 I think the rest of the school year is going to be a bit that way, so I'll just go with the flow. 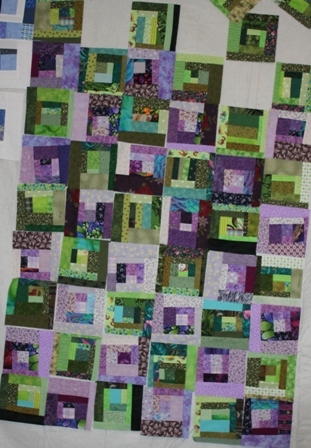 I wouldn't say that I sewed exactly a mile a minute today, but I did get a couple of rounds sewn onto the purple and green scrap blocks. I'm deciding whether they will get squared up to 5 inches or 6 inches before I sew them together. I was using a Dear Jane ruler to straighten the edges, but I might keep going for a couple more rounds. 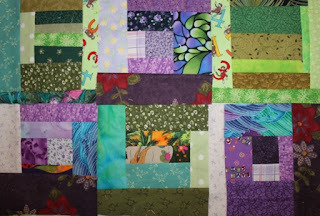 The seams to get bulky with crumb blocks and I would probably want a sashing of some sort with a smaller block. I went out for lunch today and got my toes painted purple in honor of the passionate purple month! I also popped out to the library to pick up the next book from a series I have been readying. In the afternoon the girls wanted to see a movie. Ryan is having a friend sleep over. Saturday is such a nice day, I wish there could be more of them in a week. Today is a purple day. I've got a stack of mile a minute blocks in purple. 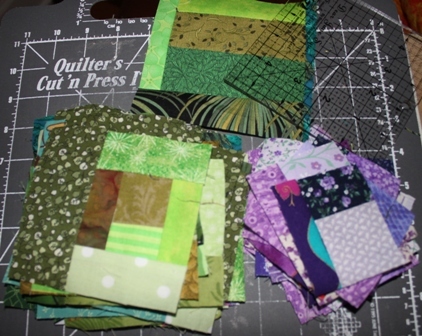 I'm going to combine them with my mile a minute blocks in green for a two color quilt. What are you working on? The Rainbow Scrap Challenge together with my new and busier work schedule have resulted in quite a few projects scattered along the way. I sat down after dinner and just started sewing things together; leaders and enders, scraps, extra blocks from projects long gone. They all got stitched to something and are waiting now to be ironed and sorted away. There is something lovely about a Friday. Especially one that doesn't lead to a trip out of town or a marathon of kid activities. We only have a usual weekend schedule to deal with and so I am feeling more relaxed than I can remember in a while. After much arguing with secretaries and clerks during my planning periods this week, I finally have a signed contract to go with my new job. It is a relief to know that my job won't be offered up to anyone else who wants it at the end of the year. Most evenings have found me either plugging away at lesson plans or just plain tuckered out. 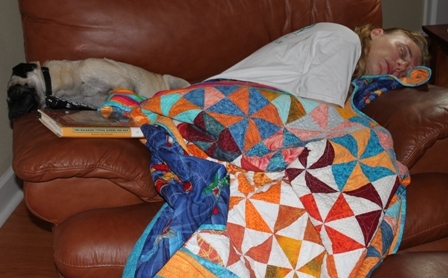 Lizzie and I were sharing a quick snooze yesterday when Kurt snuck up on me. We are out of town for the weekend to visit Mom and I have completely neglected Scrap Happy Saturday. I had a scheduled a post ready to have it ready to go, but somehow it didn't make it. Sorry about that. 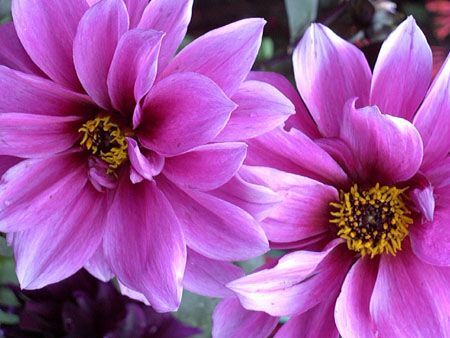 The new color of the month, as some have guessed, is purple. Think spring flowers, crocuses, irises, tulips. For now, feel free to post a round up of your green projects from last month. I meant to post a separate Rainbow Roundup link yesterday, but the days have a way of blending together when you are out of town.